Taoiseach Leo Varadkar has said he aspires to a united Ireland by consent and with cross-community support. The Irish Premier said he followed the idea of former SDLP leader John Hume of an “agreed Ireland”. Mr Varadkar said: “In terms of a united Ireland, our constitution is clear on this. Our constitution aspires to there being a united Ireland. I share that aspiration. The Taoiseach’s comments are likely to further strain his already difficult relationship with unionists in Northern Ireland. In November, the leader of the DUP Arlene Foster accused Irish Foreign Affairs Minister and Mr Varadkar’s deputy, Simon Coveney, of “aggressive” behaviour after he spoke of his desire for a united Ireland. Mr Coveney told a parliamentary committee that he wanted to see a united Ireland in his political lifetime. Mr Coveney added that any moves toward Irish unification should be careful, should learn from the past and ensure more steps are taken to protect and include a unionist minority. Uncertainty around Brexit has seen relations between Dublin and London and the DUP deteriorate in recent months. In December, Mr Varadkar admitted relations with Britain were “strained” because of disputes between governments on what kind of arrangement should be made for Northern Ireland after Brexit. The DUP has criticised Mr Varadkar’s Fine Gael Party, saying that multiple references to the possibility of a united Ireland in current Irish politicians’ lifetimes were unhelpful. 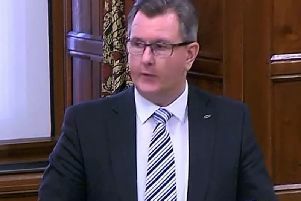 DUP MP Sir Jeffrey Donaldson recently claimed both the Taoiseach and Simon Coveney had used language that would not repair relationships between the Irish government and unionists.